Open auditions with cold readings from the script. No appointment necessary. NOTES:	Headshots and résumés are helpful but not necessary. If you wish to request sides in advance, please email the director at gilsavage@yahoo.com. Auditions are at 7:00 pm both days. 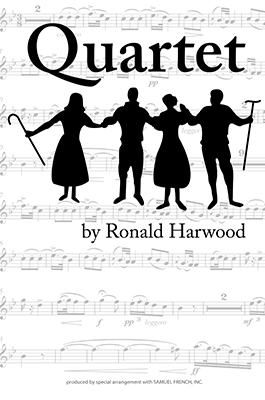 This show is cast with seniors and is about senior opera artists. Please consider that we are looking for actors that may pass for 70+ years. Singing is not done in this production; however, actors will need to learn to lip-sync to a recording. The show requires British accents. CECILY (CISSY) ROBSON: A kind soul suffering the very early stages of dementia, forgetting things and mixing up memories with reality. Buxom but innocently appealing, she has a real fear of being sent away to a home that caters to dementia. She is the driving force of positivity and often provides the comic relief. WILFRED BOND: Always on the make, he is an easy-going artistic sort with a bawdy, raunchy sense of humor. He hides behind comedy to avoid the reality of growing old. He teases and taunts but is fiercely protective of his former colleagues. REGINALD PAGET: A dapper and dignified gentleman who takes pride in his appearance. He is an intellectual writing his biography and searching for the meaning of art. Very bitter, he has never gotten over Jean walking out of their marriage. JEAN HORTON: "The Grande Dame" of opera feels the sting of her fall from grace, which compelled her to end her days in a charity home. The demanding former diva is selfish, has no filter and lacks empathy. Now frail and scared, her refusal to participate in the Verdi celebration forces her to come to terms with her past. Lifelong friends Wilf and Reggie, together with former colleague, Cissy, are residents of Beecham House, a home for retired opera singers. Every year on Giuseppe Verdi's birthday, the residents unite to give a concert to raise funds for their home. But when Jean Horton, a former Grande Dame of the opera who has fallen on hard times, who also happens to be Reggie's ex-wife and the fourth and most celebrated member of their former quartet, unexpectedly moves into the home, the plans for this year's concert begin to unravel. As old grudges threaten to undermine past glories and theatrical temperaments wreak havoc with the rehearsal schedule, it becomes apparent that having four of the finest singers in English operatic history under one roof is no guarantee that the show will go on. This is a wickedly comic play – touching and poignant – about art, aging and how the human spirit remains undimmed. The play was made into a popular film in 2012 by Dustin Hoffman.